The direct thermo and photodecomposition of chlorfenapyr was studied. The results show that the loss percentage of the compound was increased with increasing the degree of temperature and the time of exposure. Over 60% of chlorfenapyr residues were degraded after 144, 96 and 48 h of exposure to 30, 40, 50°C, respectively. Also the photo decomposition of chlorfenapyr was increased by the prolongation of exposure period to record 61.93 and 90.07% after 48 h of exposure to direct sunlight and UV-rays, respectively. The residue half life values were 12.03 and 5.71 h after `exposure to direct sunlight and UV-rays, respectively. Four major photo degradation products were isolated for chlorfenapyer (m/z = 408, 353, 284, 202 and 192 and identified by their mass spectra comparing with library scan, which as follows: N-methoxyethylpyrrole-2-phenyl-3-cyano-4-Bromo-5-difluoromethylinum cation, N-methyl ethyl ether (2-trifluoromethyle-5-pyrrolium cation), 2(P-chlorophenyl)-3-carbonitrile pyrrolium cation and 2 (P-chlorophenyl)-3-cyano-4-oxo-5-trifluoromethyl pyrrolidine. Chlorfenapyr is a pyrrole group of insecticide (4-Bromo-2-(4-chlorophenyl)-1-(ethoxymethyl)-5-(trifluoromethyl)-1H-pyrrole-3-carbonitrrile) used as broad spectrum insecticide /acarcide to control whitefly, thrips, caterpillars mites, leaf miners and aphids (Ditya et al., 2010). With a novel mode of action Chlorfenapyr is active against resistant insect and mite strains (Leonard, 2000). As well known photo and thermo decomposition are the most destructive pathways after their release into the environment. The influence of the climatic factors on pesticides breakdown is extremely complex. It seems that the chemical processes of pesticides are affected by changes in heat and light. Photolysis occurs where the radiant energy in the form of photons breaks the chemical bonds of molecule. Both heat and light affect the efficiency of pesticide which are measured by the duration of their residual effect (Burrows et al., 2002). Hou et al. (2005) and Cao et al. (2006) studied the photo catalytic degradation of chlorfenapyr in TiO2 suspensions using orthogonal experiments. The rate of photo catalytic degradation was greater than photodegradation, the sequence of influence factors were TiO2 dosages initial concentrations of chlorfenapyr, pH and temperature. TiO2 dosage showed the most visible effect among the factors. Therefore, this study aims to elucidate the thermo and photo decomposition profile of chlorfenapyr in the environment. Chlorfenapyr obtained: From Shoura Company (Egypt). The atmospheric temperature was measured daily during the exposure time (dominated atmospheric temperature was 30.5°C). Residues of the exposed tested pesticides were quantitatively transferred to standard glass stopper test tubes with methanol and the residues were determined by HPLC. 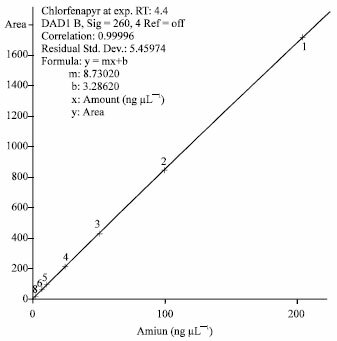 HPLC conditions for quantitative analysis of chlorfenapyr: According to Cao et al. (2005) Agilent 1100 HPLC with UV photo diode array detector (DAD) has proven to be suitable for chlorfenapyr determination. Chromatographic separation was done in Zorbax SB-C18 column (4.6 mm i.d. x150 mm length). The detection at 260 nm offers suitable chromatograms for the quantification of chlorfenapyr. The mobile phase was methanol: Water (80:20 v/v) with 1 mL min-1 flow rate. The column oven was kept at 25°C. The volume of the injection loop was 20 μL. Under the previous conditions, chlorfenapyr showed a retention time of 4.4 min and a good chromatographic separation as shown in Fig. 1. Good linearity was obtained in the range 0.01-200 ng μL-1 of active ingredient with a correlation coefficient of 0.99996 as shown in Fig. 2. Statistical analysis: All obtained data were subjected to statistical analyses and graphically illustrated according to Timme and Fisher (1980). 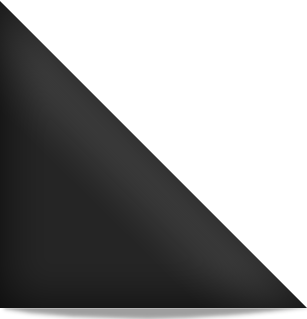 The half life (t1/2) was calculated mathematically according to Moye et al. (1987). Effect of temperature on chlorfenapyr: Table 1 show that the loss percentages were 4.64, 7.88 and 17.88% after 6 h of exposure to temperature at 30, 40 and 50°C, respectively. Increase in the exposure period led to increase the percent of loss. More than 60% of chlorfenapyr was degraded after 144, 96 and 48 h of exposure to 30, 40 and 50°C, respectively. Loss percentages of chlorfenapyr ranged between 4.64 to 64.62; 7.88 to 75.65 and 17.88 to 94.04 when exposed for 144 h to 30, 40 and 50°C, respectively. The calculated residues half life values of chlorfenapyr were 90.35, 55.67 and 20.63 h at 30, 40 and 50°C, respectively. Previous results clearly indicate that the rate of degradation of the chlorfenapyr was influenced by several factors including the chemical structure, vapor pressure, temperature and the period of exposure. Gradually, the percentage loss of pesticide residues increases by prolonging the period of exposure. Shokr (1997) found that increasing temperature degrees and prolongation of the exposure time increased the percent loss of insecticides primiphos-methyl, fenitrothion, malathion and prothiofos. Hou et al. (2005) reported that the rate of photo catalytic degradation of chlorfenapyr was greater than that of photodegradation, the sequence of influence factors were TiO2, dosages initial concentrations of chlorfenapyr, pH and temperature. Photo stability of chlorfenapyr: Table 2 reveals that the percent of losses of chlorfenapyr after 1 h of exposure to direct sunlight and UV-rays were 3.74 and 20.73%, respectively. These values increased gradually by the prolongation of the exposure period to reach 61.93 and 90.07% after 48 h of exposure to direct sunlight and UV-rays, respectively. The residue half life values were 12.03 and 5.71 after exposure to direct sunlight and UV-rays. Such results emphasize that the photo degradation of chlorfenapyr was relatively more affected by UV-rays than the direct sunlight. This confirms that the residues of the tested pesticides were greatly deteriorated when exposed to UV-rays rather than to direct sunlight, especially with the prolongation of the exposure period. Results further refer that the rate of degradation of the tested insecticide varied according to its chemical structure and the period of exposure to either direct sunlight or UV-rays. Generally speaking the effect of ultraviolet light (UV) on the degradation of pesticides is of considerable interest to scientists in that field, UV-light exerts chemicals changes on a large number of pesticides such as hydrolysis, oxidation and isomerization. When such reactions occur under field conditions, they induce considerable environmental contamination and produce serious pesticide residues on and in agricultural products. Sensitivity to sunlight may limit the use of certain potential pesticides in the agricultural classical approaches. To overcome this obstacle, chemical modifications in the molecular structure of the pesticide are practiced or, sometimes, of UV-absorbing materials are added to the final formulation. However, both methods may suffer serious drawbacks. Identification of the photo degradation products of chlorfenapyr: The technical material of chlorfenapyr was subjected to GC-MS investigation, adopting the conditions previously mentioned in the materials and methods to identify the chemical constituents of the detected compounds. Figure 2 shows the chromatogram of chlorfenapyr which was detected at 22.01 min retention time and its mass spectrum analysis is illustrated in Fig. 3. The samples of chlorfenapyr were analyzed after exposure to UV-rays for 24 and 48 hours by GC-MS to identify their chemical constituents. Table 3 and Fig. 4 revealed the formation of four major isolates photo degradation products together with parent compound (m/z = 408, 353, 284, 202 and 192) were detected and identified by their mass spectra comparing with library scan. Table 3 shows that the amounts of chlorfenapyr after exposure to UV-rays for 24 and 48 hrs. decreased to 51.46% as percent area, compared to 8.93% for compound (no. 1), 3.68% for compound (No. 2), 4.57% for compound (No. 3) and 13.24% for compound (No. 4). The pathway of photo degradation can be explained as follows: The parent compound (chlorfenapyr) losses a chlorine atom and a fluorine atom to yield N-methoxyethyl pyrrole-2-phenyl-3-cyano-4-bromo-5- difluromethylinum-cation compound (No. 1), C15H12N2OF2Br, with 6.88 and 8.93% area after 24 and 48 h of exposure, respectively and a molecular weight 353. Also, N-methyl ethyl ether (2-trifloromethyle-5-pyrrolium cation) (compound (No. 2) was yielded from chlorfenapyr by the loss of a cyano group and a bromine atom as shown in Fig. 4, C8H9NOF3, m/z = 192 and 2.91 and 3.68% area after 24 and 48 h of exposure, respectively. Furthermore, 2( P-chlorophenyl)-3-carbonitrile pyrrolium cation (compound No. 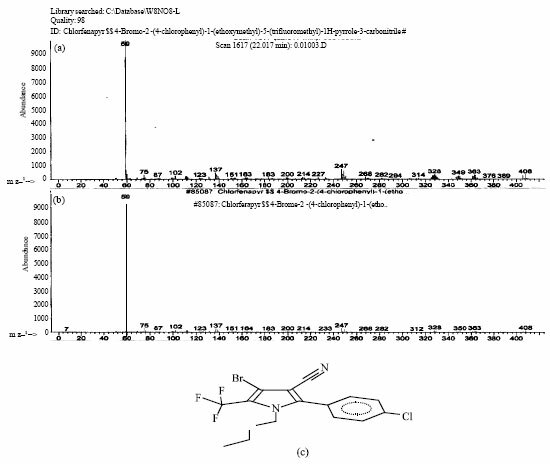 3), C11H6N2Cl, with 3.53 and 4.57% area after 24 and 48 h of exposure, respectively and a molecular weight 202 was yielded from chlorfenapyr by loss of a bromine atom, trifluromethyl and ethyl methyl ether. The parent compound chlorfenapyr losses amethyl ethyl ether group and a bromine atom to yield 2 (P-chlorophenyl)-3-cyano-4-oxo -5-trifluromethyl pyrrolidine (compound No. 4), C12H6N2OF3, with 11.25 and 13.24% area after 24 and 48 h of exposure, respectively and a molecular weight 284 as shown in Fig. 3. The results revealed that the residues were greatly deteriorated when exposed to UV-Rays sunlight and high temperature. The most prominent effect was related to the impact of UV-rays incomparable to direct sunlight. Consequently to overcome this situation an addition of UV-absorbing material to the product formulation will incrementally decrease the rate of degradation. In the same trend the storage of the end product within the proper environmental conditions can delay the product degradation. Burrows, H.D., M.L. Canle, J.A. Santaballa and S. teenken, 2002. Reaction pathways and mechanisms of photodegradation of pesticides. J. Photochem. Photobiol. B. Biol., 67: 71-108. Cao, Y., J. Chen, Y. Wang, J. Liang, L. Chen and Y. Lu, 2005. HPLC/UV analysis pf chlorfenapyr residues in cabbage and soil to study the dynamics of different formulations. Sci. Total Environ., 350: 38-46. Cao, Y., L. Yi, L. Huang, Y. Hou and Y. Lu, 2006. Mechanism and pathways of chlorfenapyr photocatalytic degradation in aqueous suspension of TiO2. Environ. Sci. Technol., 40: 3373-3377. Ditya, P., S.P. Das, P.K. Sarkar, A. Bhattacharyya, 2010. Degradation dynamics of chlorfenapyr residue in chili, cabbage and soil. Bull. Environ. Contam. Toxicol., 84: 602-605. Hou Y., Y.S. Cao, H.H. Liu and Y. Lu, 2005. 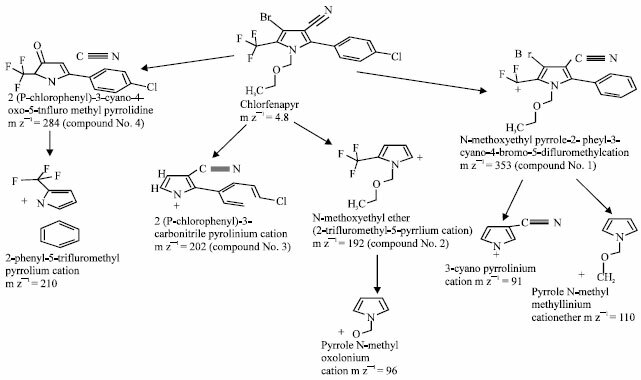 Photocatalytic degradation of chlorfenapyr. J. Shanghai Jiao tong, Univ. Agric. Sci., 23: 289-293. Leonard, Paul.K., 2000. Chlorofenapyr a novel IPM compatible resistance management tool for fruit production. Acta Hort., 525: 257-276. Moye, H. A., M.H. Malagodi, J. Yoh, G.L. Leibee, C.C. Ku and P.G. Wislocki, 1987. Residues of avermectin B1a rotational crop and soils following soil treatment with (C14) avermectin B1a. J. Agric. Food Chem., 35: 859-864. Shokr, A.A.S., 1997. Environmental pollution by pesticides residues. Ph.D. Thesis, Faculty of Agriculture, Kafer El-Sheikh University, Kafr El-Sheikh, Egypt. Timme, G. and H. Fisher, 1980. Statistical interpretation and graphic representation of the degradationed behaviour of pesticide residues. Pflanzenschutz. Nachr. Bayer., 33: 47-60.